Our final grant in 2018 was to Leap - they are an award-winning national charity that works with young people aged 11-25 who are struggling with conflict. Leap’s vision is that every young person in conflict has a route to positive support that can transform their opportunities. This grant helped to fund ten young people from Depaul to attend Leap’s three-day Leadership course. The Leadership course is part of Leap’s flagship community-based programme, Improving Prospects, designed to give young people an insight into the causes and consequences of conflict, as well as develop their capabilities and confidence to manage personal ad interpersonal conflict. The Leadership element is a three-day course focused on young people’s understanding and self-awareness of conflict, specifically in relation to choices and responsibilities. Young people learn to recognise negative influences and behaviours and set immediate goals for change. They also benefit from intensive and personalised one-to-one sessions with project staff before, during and after training. These increase engagement, deepen learning and support progression. Courses are delivered in partnership with other organisation already working with hard-to-reach young people. Improving Prospects helps young people to transform their lives: 90% of graduates feel that Leap has made a positive difference to where they are in their lives one year after taking part. data for 92 young people who took part in Improving Prospects between March 2016 and February 2017, and follow-up interviews with 35 graduates. The grant was made to support year-round drop-in workshops. Through these, they aim to create an open, supportive (and fun!) environment which gives young people the opportunity to develop their skills, boost their self-confidence, and meet their peers (very important when working with isolated young people). 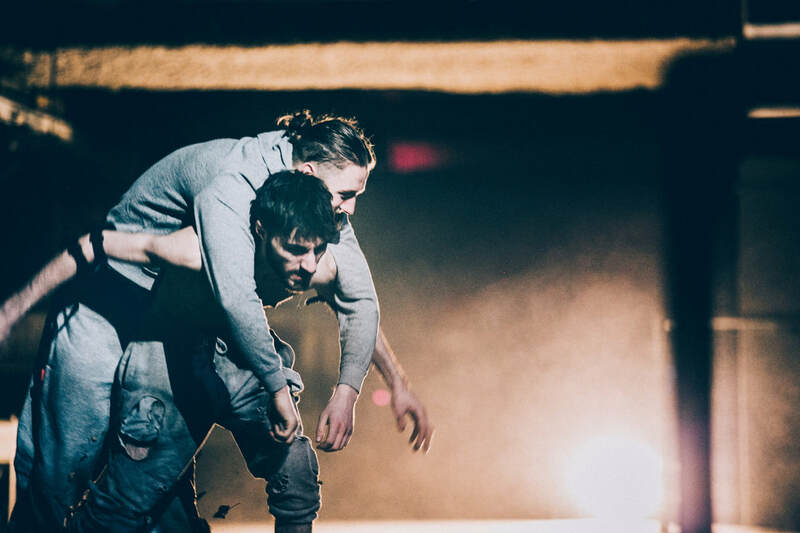 The Open House Project (OHP) is an intensive 12 week project of drama participation, life and employment skills, literacy, counselling, and help to recognise and regulate emotions. Here's the second of our updates from charities we have been able to support this year. Earlier this year we announced that Sherborne in the Community had supported 4 charities in the form of grants. As we open our next round of grant applications, we'd like to share a little more about the work that has been possible from our initial grants. First up, Boxing Futures. 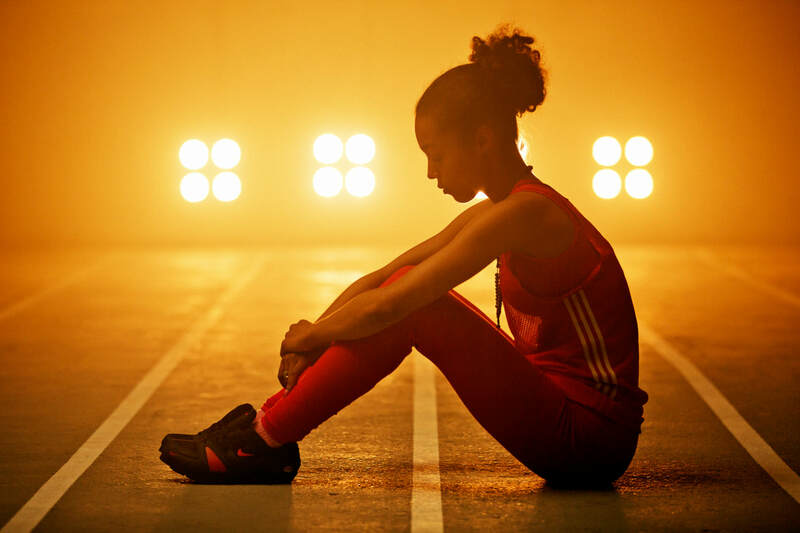 They provide the opportunity for young people to enjoy a fitter, healthier lifestyle, whilst improving self-confidence through engagement in a positive activity. The team use this new found experience and energy in a young person’s life as a platform from which they can pursue routes into employment, education, training and volunteering (EETV). At Boxing Futures, they engage with the ‘whole person’ and do not just focus on one aspect of their life. They aim to improve chances of EETV, through working with young people to develop their soft skills and pro social behaviours. 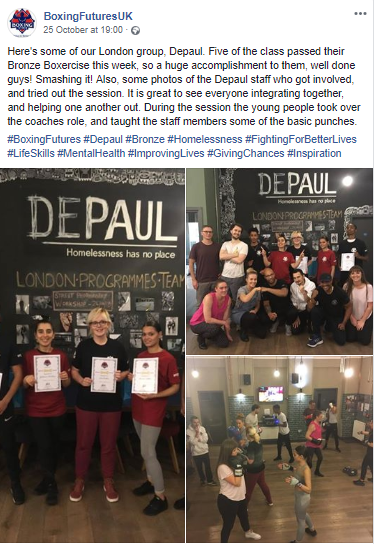 Our grant enabled a 12 week programme to be delivered with Depaul delivering some great results (see below). Please take a look at their website and their social pages to keep up to date with their great work. We'll bring you news of our other grant recipients over the next month. Sherborne in the Community was delighted to receive a substantial donation from Sherborne School from the end-of-term Commemoration in summer 2018. The donation will enable us to continue to support charities working with young people in London. We are very grateful to the chaplain, David Campbell, and everyone who contributed to the collection. Maintaining and developing our relations with Sherborne School, the other schools in Sherborne and Old Shirburnians is something we believe is very important. The connections between Sherborne House (now SITC) and Sherborne School go back to the early 20th century (see our History page for more information). We are always interested to hear from current or former Shirburnians who would like to find out more about SITC and the work we do, and how they can support it. For those who are interested, we can also sometimes arrange visits to some of the charities we support. For more information contact the Chair of the Trustees James Nurton or Secretary Roger Watkins. Thanks to the generosity of our supporters and careful management of our resources, the Trustees were delighted to be able to make grants to four charities working with young people in London earlier this year. All of the grants were made towards specific, costed projects and we will post further reports on the outcomes in due course. The grant recipients were decided in a thorough process, which included the review of written applications and a visit to each charity and a vote by the trustees. We expect to launch our 2019 grant process soon and welcome applications for grants of up to £5,000 from charities working with young people in London. More details will be posted on the website shortly. The SITC trustees were able to hold our quarterly meeting at Sherborne House last week. We are very grateful to DePaul for allowing us to use the meeting room and hear from their staff about the progress that this new facility has given them. We heard stories that even before the building was officially open, they had a young person turning up looking for help and they were able to react and find him somewhere safe to spend the night. From that moment on the teams that work out of Sherborne House have continued to thrive and support 100s of young people and their families through Nightstop and Alone in London. This has taken the form of finding safe places to stay while they get back on their feet, advice and mediation for families in difficult times, as well as being able to include the young people in future service development through Advisory boards and panels. It was also fantastic and inspiring to hear how the design and services that have been possible within Sherborne House are now the template they are looking to roll out across the country. They have seen clear benefits from having a building within the community that can mix both their operational activities with their front line service. As trustees we look forward to the continuing to hear about the development and benefits that De Paul can deliver from Sherborne House. London’s Deputy Mayor James Murray and the Duchess of Norfolk today (Wednesday, 24 May) officially opened a new homelessness centre in central London. The Endeavour Centre at Sherborne House, near London Bridge, is an innovative space that combines help in a crisis with support for those young people who are rebuilding their lives. The national headquarters for Depaul UK, the building also provides a hub for Depaul’s award-winning Nightstop service – Britain’s only national network for emergency accommodation for young people. James Murray, London’s Deputy Mayor for Housing and Residential Development, and the Duchess of Norfolk, Patron of Depaul International, jointly cut the ribbon to open the centre, in Decima Street, Southwark. Depaul UK CEO Martin Houghton-Brown said: “No young person should ever have to sleep in an unsafe place. The creation of the Endeavour Centre in London means that not only has Nightstop, with its brilliant offer of a safe bed for young people in crisis, got a base, but that young people who would otherwise be at risk on the streets can have somewhere safe to be during the day. Mr Houghton-Brown thanked Depaul UK’s key partners who have made the Endeavour Centre possible: Sherborne in the Community, LandAid and players of People’s Postcode Lottery, as well as The Clothworkers’ Foundation, OVO Foundation, easyCoffee and the many individual donors. We had an opportunity in our December trustee meeting to take a look back at what has been achieved over the last 12 months by Sherborne in the Community. I don't think anyone would have predicted the changes we've seen or the bright future ahead of us. We started the year trying to ensure the building remained secure. Evicting squatters and using the services of Live In Guardians occupied the closing months of 2015. Our next priority was to look at the future options for the building - should we find a new tenant(s); was selling the property an option to use the funds to achieve charitable objectives elsewhere; keeping the building maintained and secure. There was a great deal of discussion and we progressed every avenue. Our priority always has been to ensure we continue to offer opportunities and support for the young people of London as well as trying to preserve the history given to us for over 100 years. This meant that last Christmas was spent reviewing various proposals put forward by local and national charities to use the building to achieve these objectives. The quality of these assured us that there remained a viable option to lease the building and keep the history alive. Following various open days and meetings, the proposals were filtered down to a very small group. This allowed us to analyse these in real detail and meet the key people from the charities to understand their views on the future. While all of this was going on we continued to deal with the after effects of the closure of Kids Company. As trustees we've learned a lot but it's been an expensive process for a small charity such as us. Most of this work is now completed thanks to the great efforts of some of the trustees to achieve the best outcome for the charity. The Summer confirmed that our future should be with De Paul and the work on the lease continued at pace. Once all the paperwork was completed, we've seen real progress in the building work at the site and continue to work with De Paul on creating a positive outlook for our historic building in Bermondsey. The final trustees meeting of 2016 also allowed us to think about what else beyond Decima Street we can offer as a charity. There will be more news to come in 2017 but we look forward to increasing our support for young people both near and far. Happy Christmas and a prosperous New Year from all at Sherborne in the Community! At the end of the Summer we were able to announce the news that we have selected a new tenant of Sherborne House. 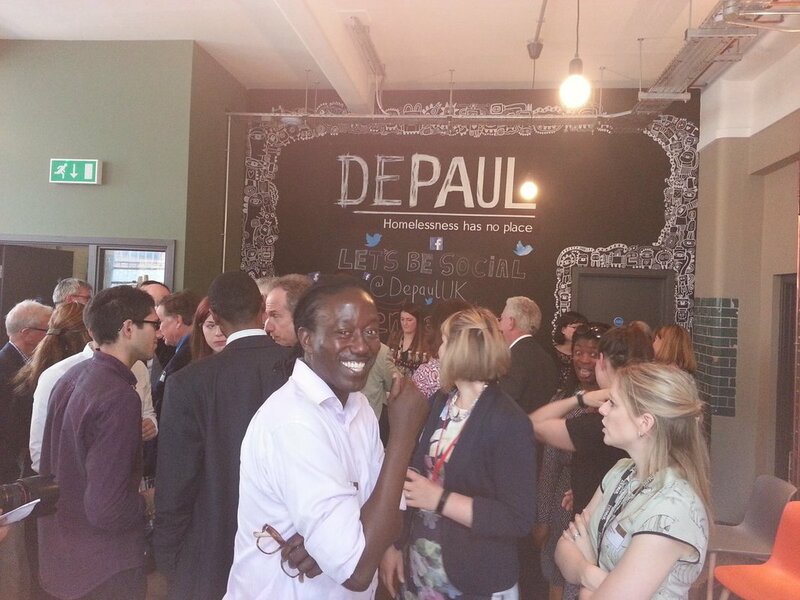 Depaul will use the building to provide a range of services to young people throughout London, including as a base for its Nightstop programme for young homeless (uk.depaulcharity.org.) As well as being encouraged by the value and importance of DePaul’s work, the trustees were impressed by its ambitious plans for Sherborne House. These include a substantial investment in redevelopment - opening up the building, making the most of all of the space and offering some innovative services. The redevelopment work started in September and is due to be finished early in 2017. DePaul are also fully committed to developing contacts with the School and Old Shirburnians, and we hope to bring details of some specific initiatives soon. 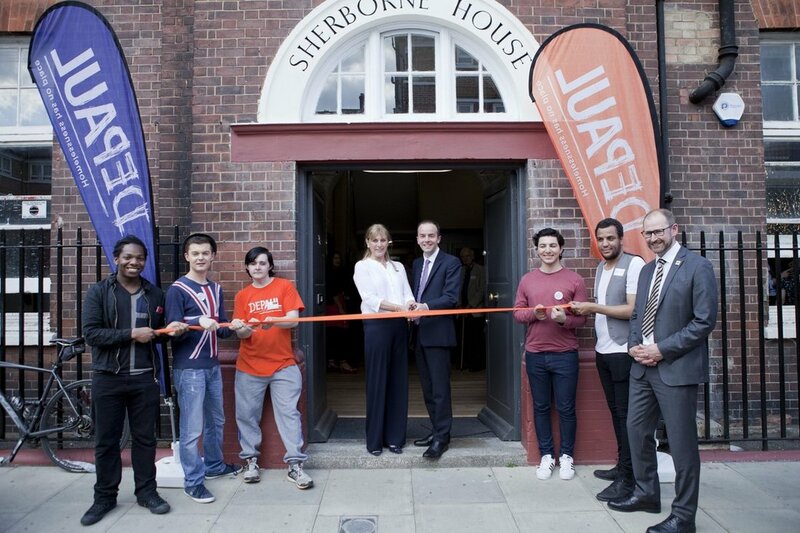 Some of our trustees were able to attend the first reception event held at Sherborne House where Depaul UK CEO Martin Houghton-Brown shared the vision for our historic building. It was also an opportunity to thank some of the donors and other charitable organisations that have made this possible.